Q: Have scientists confirmed that e-cigarettes cause an incurable respiratory disease called “popcorn lung”? A: No. The vapor of some e-cigarettes contains a chemical associated with popcorn lung, but there’s not enough evidence to conclude they cause the disease. I ran into an article about vaping that I’m not sure about. I know there’s been a ton of media coverage on the topic and it’s pretty difficult to sort the fake from the real, at least for me. If you could verify this article for me, that would be fantastic. Electronic cigarettes, or e-cigarettes, deliver nicotine, flavorings and other chemicals to users in the form of a vapor. They’re “designed to simulate the act of tobacco smoking” and “often promoted as safer alternatives to traditional cigarettes,” writes the National Institute on Drug Abuse. One of our readers forwarded us an article on e-cigarettes published on the website Discover Newz in April. The article’s headline said, “Confirmed: E-cigarettes Cause a Horrible Incurable Disease Called ‘Popcorn Lung.’ Worse Than Lung Cancer!” Other websites have published identical pieces. Cumulatively, Facebook users have shared this article tens of thousands of times. While the body of the article summarizes the findings of a legitimate scientific study, the headline is wrong. Researchers have not confirmed that e-cigarettes cause bronchiolitis obliterans, or “popcorn lung.” But they do know that a chemical associated with the disease has been found in the vapor of some e-cigarettes. Bronchiolitis obliterans is an incurable disease characterized by the scarring of the smallest airways in the lung, the bronchioles. That scarring limits the passage of air. If the disease becomes severe enough, the only treatment option may be a lung transplant. As the NIDA notes, much remains unknown about the health risks of e-cigarettes, including whether or not they are safer than conventional cigarettes. There also isn’t enough evidence to say definitively they’re effective at helping people to quit smoking. We’ll first provide some background on e-cigarettes, including their sales trend and regulatory status, before moving on to the evidence for and against the theory that they cause bronchiolitis obliterans and other health concerns. E-cigarettes were first introduced into the U.S. market in 2007. With roughly $2.5 billion in projected sales in 2014, they could surpass the sales of conventional cigarettes by 2023, if the growth trend continues, according to Well Fargo Securities. However, the Wall Street Journal reported that e-cigarette sales declined in 2015, “bringing an end to five years of triple-digit growth.” The decline was likely due to “[c]ustomer dissatisfaction, inventory backlogs, state laws and safety issues,” the paper said. The Centers for Disease Control and Prevention says 3.5 percent of adults were e-cigarette users in 2015. Among adult e-cigarette users, 59 percent were also current cigarette users, 30 percent were former cigarette users and 11 percent had never been a smoker. But those percentages differed substantially by age. The vast majority of e-cigarette users 45 or older were either former or current smokers. But 40 percent of e-cigarette users 18 to 24 years old had never been cigarette smokers. The Food and Drug Administration didn’t start regulating e-cigarettes until 2016. The finalized rule included banning their sale to minors, both in person and online. That ban went into effect in August 2016. But e-cigarette use already had climbed among individuals under 18. Between 2011 and 2015, e-cigarette use increased more than 10-fold — from 1.5 percent in 2011 to 16 percent in 2015 — among high school students who reported that they used e-cigarettes in the past month, says the CDC. Past-month e-cigarette use also increased almost 9-fold for middle schoolers during this period — from 0.6 percent to 5.3 percent. In total, about 3 million middle and high school students were current users of e-cigarettes in 2015, says the CDC. Do E-Cigarettes Cause Popcorn Lung? So what threat do e-cigarettes pose to the public’s health? It’s unclear whether they can cause bronchiolitis obliterans, or popcorn lung, but that doesn’t mean they’re harmless. The viral article sent to us by our reader discusses a December 2015 study conducted by scientists at the Harvard School of Public Health. The study, led by Joseph G. Allen, an assistant professor in the environmental health department, looked at whether or not flavored e-cigarette vapors contained the chemicals diacetyl, acetoin and 2,3-pentanedione. Researchers have previously associated the inhalation of popcorn flavoring chemicals, which contained diacetyl, with bronchiolitis obliterans in workers at microwave popcorn factories — hence the name “popcorn lung.” Acetoin and 2,3-pentanedione are chemically similar to diacetyl and also used in flavorings. The viral article does correctly state that the 2015 study, published in the journal Environmental Health Perspectives, found at least one of these three chemicals in 47 of the 51 e-cigarette vapors studied. Diacetyl was found in 39 of the 51 e-cigarette vapors. In fact, Allen and his colleagues write, “Two companies explicitly stated that their products do not contain diacetyl in written communication, yet in our testing we did find diacetyl in their product.” There were over 7,000 e-cigarette flavors on the market as of 2015. But what evidence is there now to suggest that they do cause the disease? To answer that question, we have to take a closer look at the study on popcorn plant workers. The NIOSH researchers also point to two prior experiments conducted by other NIOSH scientists on rats. The two studies aimed to tease out the effect of popcorn flavorings generally and diacetyl specifically on lung health. In a 2002 study, rats exposed to popcorn flavoring vapors developed “severe injury” to their lung airway tissue. In a 2004 study, rats exposed to pure diacetyl vapors developed “similar airway damage (although less extensive),” explain the authors of the 2006 paper. Along these lines, the NIOSH researchers make a point to mention that “because flavorings are complex mixtures of many chemicals, most of which have not been evaluated with respect to inhalation toxicity, focusing solely on diacetyl air concentrations may not be adequate to assess risk in different plants using a variety of different flavorings.” This means that it might not be diacetyl alone that can causes respiratory issues. In fact, other studies have found that e-cigarette users may be exposed to other various toxic chemicals that may pose a risk to lung health when inhaled, note the Harvard researchers. Two separate reviews of the literature conducted by Priscilla Callahan-Lyon and Michael S. Orr, FDA researchers at the Center for Tobacco Products, for example, concluded that e-cigarette users may be exposed to less toxins than conventional cigarette users, but the data are too limited to make a definitive conclusion. What is certain, however, is that the nicotine in e-cigarettes poses health risks, especially to minors. “Nicotine is a highly addictive drug, and recent research suggests nicotine exposure may also prime the brain to become addicted to other substances,” says the NIDA. In other words, nicotine may be a gateway drug. “Nicotine exposure during adolescence” can also “harm the developing brain,” adds the CDC. Multiple studies also have found that the actual concentrations of nicotine in e-cigarette vapors were significantly different from the labeled amounts. And those labeled as not containing nicotine were found to contain low levels of the substance. A study published in March 2016 in the journal PLOS One also found that high school students in South Korea who used e-cigarettes were more likely to have been diagnosed with asthma and to miss school “due to severe asthma symptoms” than students who didn’t use the devices. Jun Ho Cho, an epidemiologist at Hanyang Women’s University in South Korea, and Samuel Y. Paik, an industrial hygienist at the Lawrence Livermore National Laboratory in California, surveyed 35,904 high school students for their study. So while it’s still unclear whether e-cigarettes cause popcorn lung and whether they’re effective tools for quitting smoking, what is certain is that they aren’t harmless, especially to children and teens. 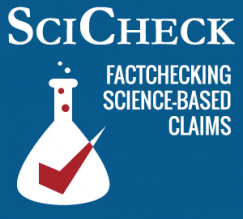 Editor’s Note: Have a science question on a public policy issue? Fill out our form on the Ask SciCheck page. SciCheck and Ask SciCheck are made possible by a grant from the Stanton Foundation. “Confirmed: E-Cigarettes Cause a Horrible Incurable Disease Called ‘Popcorn Lung.’ Worse Than Cancer!” Discover Newz. 12 Apr 2017. National Institute on Drug Abuse. “Electronic Cigarettes (e-Cigarettes).” Accessed 26 May 2017. Allen, Joseph G. et al. “Flavoring Chemicals in E-Cigarettes: Diacetyl, 2,3-Pentanedione, and Acetoin in a Sample of 51 Products, Including Fruit-, Candy-, and Cocktail-Flavored E-Cigarettes.” Environmental Health Perspectives. 8 Dec 2015. Centers for Disease Control and Prevention. “Flavorings-related Lung Disease.” Accessed 26 May 2017. Regan, Annette K et al. “Electronic nicotine delivery systems: adult use and awareness of the ‘e-cigarette’ in the USA.” Tobacco Control. 27 Oct 2011. U.S. Department of Health and Human Services. “E-cigarette Use Among Use and Young Adults.” Surgeon General’s Report. 2016. Bonnie Herzog et al. “Equity Research: ‘Tobacco Talk’ — Q4 U.S. Vapor Retailer Survey.” Wells Fargo Securities. 22 Jan 2015. Mickle, Tripp.”E-Cigarette Sales Rapidly Lose Steam.” Wall Street Journal. 17 Nov 2015. Centers for Disease Control and Prevention. “QuickStats: Cigarette Smoking Status Among Current Adult E-cigarette Users, by Age Group — National Health Interview Survey, United States, 2015.” 28 Oct 2016. Food and Drug Administration. “FDA takes significant steps to protect Americans from dangers of tobacco through new regulation.” Press release. 5 May 2016. Food and Drug Administration. “Three-Month Extension of Certain Tobacco Product Compliance Deadlines Related to the Final Deeming Rule.” May 2017. Murray, Patty et al. Letter to FDA Commissioner Scott Gottlieb. 19 May 2017. Kanwal, Richard et al. “Evaluation of Flavorings-Related Lung Disease Risk at Six Microwave Popcorn Plants.” Journal of Occupational and Environmental Medicine. Feb 2006. Hubbs, A.F. et al. “Necrosis of nasal and airway epithelium in rats inhaling vapors of artificial butter flavoring.” Toxicology and Applied Pharmacology. 1 Dec 2002. Hubbs, A.F. et al. “Inhalation toxicity of the flavoring agent, diacetyl (2,3-butanedione), in the upper respiratory tract of rats.” Toxicologist. Mar 2004. Callahan-Lyon, Priscilla. “Electronic cigarettes: human health effects.” Tobacco Control. 14 Apr 2014. Orr, Michael S. “Electronic cigarettes in the USA: a summary of available toxicology data and suggestions for the future.” May 2014. Centers for Disease Control and Prevention. “E-Cigarettes and Young People: A Public Health Concern.” Accessed 26 May 2017. Food and Drug Administration. “Summary of Results: Laboratory Analysis of Electronic Cigarettes Conducted By FDA.” Accessed 26 May 2017. Cho, Jun Ho and Paik, Samuel Y. “Association between Electronic Cigarette Use and Asthma among High School Students in South Korea.” PLOS One. 4 Mar 2016.